Around here, we have a distinct split of opinion on beets: one of us is repelled by the “earthy” flavor, while the other likes it in a good number of ways, especially salads. If you think you don’t much like beets, be sure you’ve tried them properly prepared: well-roasted—they take a good hour if sliced about ¼" thick—and then appropriately accompanied, say with balsamic vinegar and blue or goat cheese. Never boil beets (few if any vegetables take well to preparation by boiling). But the beet reaches its apotheosis with borscht, and that’s the main use we grow them for. Beets are normally direct-seeded in our climate. They are fairly frost-hardy and so can be planted in the garden 30 days before the frost-free date—many source say “as soon as the ground can be worked”—but less damping-off occurs, and stands are better, when the first planting is delayed until the average daytime soil temperature at seeding depth is 50° F or higher. Although beets grow well during warm weather, seedlings are better established under cool, moist conditions. You can succession-seed, but if you’re harvesting mainly for freezing, why bother? As the ad says, just do it. Watch the soil temperature daily, and, when it hits 50°, in go the beet seeds. If you want to go by the traditional “30 days before the frost-free date”, you would put them in around May 1st; that may be a bit late for things for which “the seedlings are established more easily under cool, moist conditions”, and we reckon April 15th to be safe (beets mature in about 2 months, though the Lutz type can be left to grow as long as it wants). If you really like beets, you should be readily able to grow a second crop in the same season: if you plant the first on April 15th, they should be harvestable by mid-June; you can then plan on seeding a second crop in mid-August for harvest in mid-October (beets don't mind cold or even mild frost). All sources emphasize that, though beets are tolerant of many things, they don’t do their best in hard, clay-ey, or crusty soils: they want deep, well-drained, friable soils with enough organic matter in it to prevent crusting. This, as all will doubtless notice, is the general formula for vegetables we grow as “roots”, and as we say here many a time, it behooves the home gardener to have a suitably sized patch of ground (or, better, raised bed) that has been worked over to make it a good “roots” bed, with lots of humus or compost or even plain sand added to make a friable sandy loam, and at least the larger stones and pebbles removed from at least the upper few inches. Beets are somewhat sensitive to soil acidity: a low (acid) soil pH results in stunted growth. They prefer a pH of 6.2 to 6.8, even though they will tolerate 6.0 to 7.5. That, too, is more or less a general rule for “roots”. Beets are almost invariably direct-seeded where they will grow (as opposed to being raised as seedlings for transplanting, which they do not like.) If you fancy “baby” vegetables, you can plant your seeds closer than you expect your actual plants, then thin out early on. Personally, we think the idea of “baby” vegetables asinine—mais chacun a son goût, as the old French woman remarked while kissing her goat. For normal beets, in a deep-dug or raised bed Jeavons recommends a 4-inch spacing, though if you want to really let your Lutz types do their thing you might try 5 or even 6 inches (recall that Lutz beets can get very large without becoming woody). Sow the seed about ¼ inch deep, or place the seeds on the soil surface and sift a little fine loam or sand over them. Poor stands are often the result of planting too deeply or of the soil’s crusting after a heavy rain. Some find that putting a board over the row after planting preserves soil moisture and eliminates crusting from hard rains. (The board must be removed as soon as the first seedling starts to emerge.) Use a garden fork or the like to frequently but lightly scratch the soil surface around beets, to keep it from crusting—but don’t scratch deep (not over an inch down) or you harm the roots. To obtain the highest quality, beets must make continuous growth. The soil moisture (and plant nutrient) supply must be adequately maintained to prevent checking of the growth: a lack of moisture can produce stringy and tough beets; interrupted growth because of inadequate water may cause malformed roots; an inconsistent supply of moisture may result in color difference in alternating rings of the root. In other words (duh), keep the bed well-watered (though not sodden). At least with the Lutz cultivar, beets can pretty much be left alone till the weather actually threatens to freeze the ground too hard for convenient digging. If, as we do, you freeze them for use in soups and such, you might as well let them go until rather late fall, nominal maturity dates notwithstanding. Beets are a member of the Chenopodiacaea (goosefoot) family, which also includes spinach and Swiss chard (which is in essence just a “beetless beet” grown for its leaves). The history of the beet is essentially the history of chard, its close relative and immediate ancestor. The ancestor crop of today’s beet occurs widely over the Mediterranean lands, Asia Minor, the Caucasus, and the Near East. It is believed to have originated in the Mediterranean area, spreading eastward in prehistoric times, with a secondary region of development in the Near East. It was a very chard-like plant that the Greeks, and the Romans taking after them, called beta (supposedly because as the seed pods swell they look somewhat like the Greek letter beta); the Arabs, who also knew it, called it selg, and the Portuguese and later the Spanish selga, an adaptation of the Arabic name still in use today in those lands. The leaves of the various kinds of beets in ancient times were harvested from the wild for use as a cooking green. Even then, however, many of the chard types we know today were already extant: Aristotle wrote of red chard, and Theophrastus mentioned light-green and dark-green kinds. The Romans as well as the Greeks knew chard well, and wrote frequently of its use. It was, however, apparently unknown in the Far East till the Middle Ages, being mentioned in China only from the 7th century; and the lack of a Sanskrit name for chard suggests that it spread from west to east only after truly ancient times. Chard has been used in Europe for as long as there are definite records of food plants there. In the 13th century, a German writer used the name acelga (selga is still used in Spain and Portugal), indicating that it was by then well-established in the Iberian Peninsula. In the 16th century, a Swiss botanist described a yellow form, the latest to be recorded, completing the list of types now known. But true beets—the types that produce large, fleshy, edible roots—were unknown before the Christian Era: the ancients apparently used the root of the wild beet or chard for medicinal purposes only. It was only in the 2nd and 3rd centuries A.D. that Roman epicures first set down recipes for cooking the root of Beta vulgaris—some claiming it better food than cabbage. That has to have referred to a fleshy root—it could scarcely mean the hard, fibrous root of chard (though the roots in question were probably selected from wild plants). A red beet with a definitely turnip-like root was first described as a food plant in Germany in 1558, and was a rarity at that time in northern Europe. 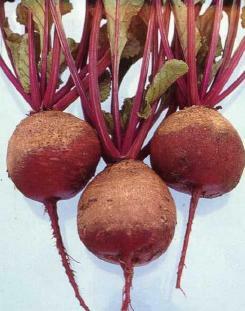 (That improved beet was called “Roman beet” in the 16th century in northern Europe and France, indicating its introduction from Italy.) But through the 17th and 18th centuries very few kinds of garden beets were known, and they remained unimportant. Up till about 1800, only two kinds—Red and Long Red—were listed by English seedsmen, though their popularity on the Continent grew faster than in the British Isles. In Italy, the Bassano variety (still grown today) was common more than a hundred years ago. In the United States, as of 1806 only one variety—Red—was listed in a leading catalogue; but by 1828 four kinds were listed. The Flat Egyptian, an American production also still cultivated today, was first grown around Boston about 1869. Other varieties grown in America are of more recent introduction. Colors of modern garden-beet varieties can range all the way from an extremely dark-purplish red to bright vermilion to white. The roots of some varieties, when cut transversely, show distinct light and dark rings, or even white alternating with red or purple, like a target. It was last modified on Monday, 28 January 2019, at 18:57 EST.